PASCAGOULA, Miss., July 18, 2005 (PRIMEZONE) -- The U.S. Navy has awarded a contract valued at $109.8 million to Northrop Grumman Corporation (NYSE: NOC) for advanced planning, long-lead material and systems engineering on the LHA(R) amphibious assault ship program. The total contract value, if all options are exercised, will be $264 million. This is the first LHA(R) construction-related contract awarded and the funds will go toward purchasing major equipment and material, as well as advanced planning and systems engineering. "This award for the initial work on LHA-R is a significant milestone for our naval forces and Northrop Grumman. We will begin planning and engineering efforts as well as purchase long lead materials to ensure this vital expeditionary strike group platform is available to the naval forces at the earliest possible time," said Philip. A. Teel, president, Northrop Grumman Ship Systems. "Our talented amphibious shipbuilding team is developing a detailed plan and timeline to deliver LHA(R) on schedule and within budget. This contract falls in line with that schedule and will allow the shipbuilding program to remain on track from design to construction." The LHA(R) will replace the LHA 1 class of amphibious assault ships, and will have the flexibility to operate in the traditional role as the flagship for an Expeditionary Strike Group as well as potentially playing a key role in the maritime pre-positioning force future (MPF(F)). As the Navy's Seabasing plan matures in the next few years, the flexibility to operate with the Expeditionary Strike Group and as part of the MPF(F) will make the LHA(R) a vital cog in the Sea Base. Northrop Grumman has already delivered USS Tarawa-class (LHA 1) and seven USS Wasp-class (LHD 1) amphibious assault ships to the U.S. Navy, with an eighth, Makin Island (LHD 8), currently under construction. LHA(R) will be a variant of the gas turbine-powered LHD 8. 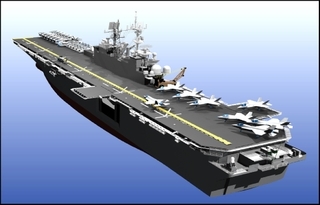 The one key difference of LHA(R) from LHD 8 is that it will be an aviation-enhanced assault ship tailored for the U. S. Marine Corps future Aviation Combat Element centered on the STOVL F-35B Joint Strike Fighter and the tilt-rotor V-22 Osprey.